Rev. Theodore L. Cuyler, the celebrated Brooklyn divine, was visiting the famous London preacher, Rev. Charles H. Spurgeon. After a hard day of work and serious discussion, these two mighty men of God went out into the country together for a holiday. They roamed the fields in high spirits like boys let loose from school, chatting and laughing and free from care. Dr. Cuyler had just told a story at which Mr. Spurgeon laughed uproariously. Then suddenly he turned to Dr. Cuyler and exclaimed, "Theodore, let’s kneel down and thank God for laughter!" And there, on the green carpet of grass, under the trees, two of the world’s greatest men knelt and thanked the dear Lord for the bright and joyous gift of laughter. The Sabbath Recorder, 4 January 1915, page 157. 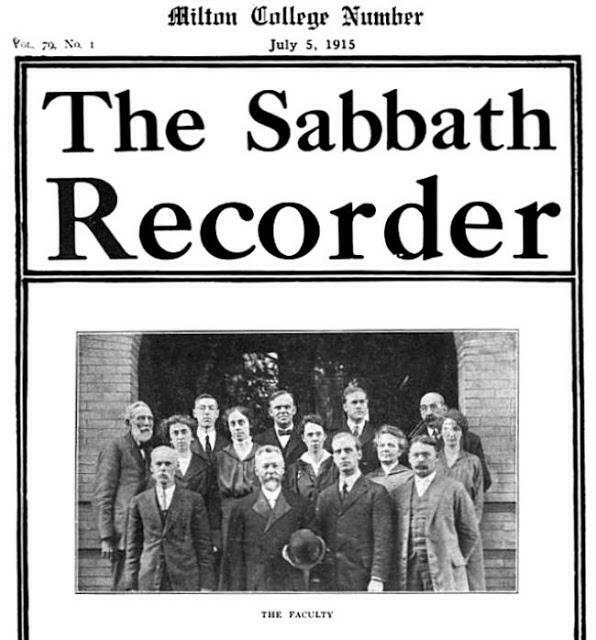 I couldn't find an image online of the specific issue of The Sabbath Recorder referenced above but I did find this cover from 1915 which I especially enjoyed because among the Milton College faculty pictured were several still living, although retired, when I was a boy. Prof "Si" Inglis, for instance, is on the right end of the front row. Prof. Leman Stringer, who directed the Milton SDB church choir and from whose orchard we purchased apples is second from right in the back row, Miss Mabel Maxson, second from left in the second row, was librarian when I was still exploring the children's section, and Miss Alberta Crandall, who taught at the college for forty-five years, is the center person in that row. All were Seventh Day Baptists, members of the churches in Milton or Milton Junction, Wisconsin. The Sabbath Recorder is, I think, the oldest continuously published religious periodical in the country. Here is how it looks today.